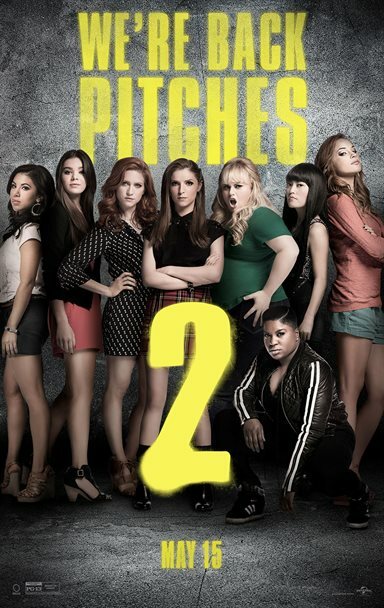 Fans of the first Pitch Perfect movie won’t be disappointed if they go in to the theater knowing it won’t be as good as the original. It was three years in the making but Pitch Perfect 2 is finally hitting theaters. As is typical with sequels, it can't compare to its predecessor but as a whole it holds its own. I really like the first Pitch Perfect so it had "lofty shoes to fill" and while it doesn't quite get there it was actually better than I expected it to be. The Barden Bellas are on top of their game but as one would expect, their blunders threaten to cost them their very existence. When the National A Capella Association pulls their membership the Bellas bargain to regain their status and all they have to do is beat the Germans at the World Championships. Piece of Cake, Right? Unfortunately the ladies seem to have lost their way as they search for their "voice" while preparing for graduation and the Competition. With every setback they encounter the group seems closer and closer to imploding. The usual cast of characters is back including Becca (Anna Kendrick, Up In The Air), Chloe (Brittany Snow, Hairspray) and Fat Amy (Rebel Wilson, Super Fun Night). As each fights their own insecurities, they explore what their live will be like without the Bellas. Each actor gives solid performances but, let's face it; none will be winning an Oscar for this movie. Wilson's Amy was too over the top I felt and Kendrick's plays Becca as an insecure, somewhat timid 20 something which is a sharp contrast from the first movie. New to the cast is Hailee Steinfeld (Ender's Game) as Emily, a ‘legacy" Bella, and Katey Segal (Sons of Anarchy) as her mom, a Bella from the 1980's. Both ladies are terrific additions to this group. While cheesy and predictable, the film has numerous funny moments that had me laughing out loud. The musical numbers are well put together and innovative and the final Bellas performance is actually very good and mildly emotional. The script is a little lacking and some of the dialogue is cringe worthy but there are some smart moments reminiscent of the first film that remind us why we fell in love with this movie in the first place. The ending is exactly what you would expect and ties everything up neatly while leaving room open for a third installment (please no). Cameos from Snoop Dogg and Robin Roberts are a pleasant and humorous surprise. As I mentioned, Wilson is given too much leeway and many of the joke, including most of hers, are downright raunchy. I also didn't quite understand Becca's infatuation with the female, German singer and the underlying lesbian theme the writers kept alluding to throughout.